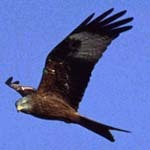 Red kites are back in Central Scotland after 130 years. Come and see these wonderful birds at Lerrocks farm just north of Stirling. Here you can visit Central Scotland's only red kite feeding station where visitors can watch these exciting birds and their spectacular flying. The farm lies on the Braes of Doune in the area of Central Scotland where the RSPB and Scottish Natural Heritage have reintroduced the red kite. At this facility, you can enjoy the birds in comfort but without the risk of disturbing what is still a fragile population. Food is put out for the kites each day throughout the year to give the birds a helping hand. Up to thirty or so are attracted to the food, depending on the weather and the season. The whole aim of the project is to have a self-sustaining population of Red Kites back in the wild, so the feeding here is minimal. Watching from the brand new hide you will have the chance to view the spectacle of the kites' flying acrobatics set against the backdrop of hill fields. Other birds you may be lucky enough to see include peregrine, kestrel, buzzards, sparrow hawk and hen harriers as well as a wide variety of smaller birds. A recent survey recorded over a hundred species on the farm. 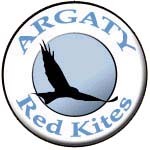 Depending on season and weather the number of kites at Argaty varies but is at its height in the autumn and winter. The population of kites is still small and extremely vulnerable but it is expanding steadily. The birds are easiest to see during the October to March period. At other times of the year the birds are busy breeding and can be much more secretive. We staff the hide only to coincide with feeding time, but the hide, visitor centre and toilets are open all day. There is an all-abilities path to the hide (500m), toilets (including disabled facilities), and visitor centre with hot drinks available (but no café) and picnic tables next to the bumblebee garden. Dogs on leads are welcome, including in the hide providing other visitors do not object. We can always find a shady place to park your car. In winter(after the clocks change), visitors should arrive prompt for 1.30pm but earlier in the season we would ask visitors to arrive for 2.30pm. We will confirm the timing when we acknowledge your booking. This is a working farm and so cannot be open every day of the year. Booking is essential. As this is not an RSPB reserve the day to day running costs of the project are funded entirely from visitors’ contributions.